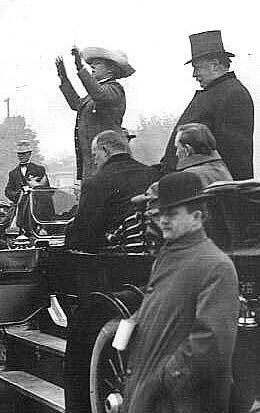 President William Howard Taft visited Salem in October 1911. He is standing in a touring car in downtown Salem with Secret Service agents and police patiently listening to the music the band conductor is leading. His Presidential proclamation of June 30, 1911 modified the boundaries of what is now the Siuslaw National Forest. ". . . The conservation of our natural resources and their proper use constitute the fundamental problem which underlies almost every other problem of our national life . . .
"As a nation we not only enjoy a wonderful measure of present prosperity but if this prosperity is used aright it is an earnest of future success such as no other nation will have. The reward of foresight for this nation is great and easily foretold. But there must be the look ahead, there must be a realization of the fact that to waste, to destroy, our natural resources, to skin and exhaust the land instead of using it so as to increase its usefulness, will result in undermining in the days of our children the very prosperity which we ought by right to hand down to them amplified and developed. For the last few years, through several agencies, the government has been endeavoring to get our people to look ahead and to substitute a planned and orderly development of our resources in place of a haphazard striving for immediate profit . . .
of the resources of this country as inexhaustible; this is not so." "Optimism is a good characteristic, but if carried to an excess it becomes foolishness. We are prone to speak of the resources of this country as inexhaustible; this is not so. The mineral wealth of the country, the coal, iron, oil, gas, and the like, does not reproduce itself, and therefore is certain to be exhausted ultimately; and wastefulness in dealing with it today means that our descendants will feel the exhaustion a generation or two before they otherwise would. "But there are certain other forms of waste which could be entirely stopped-the waste of soil by washing, for instance, which is among the most dangerous of all wastes now in progress in the United States, is easily preventible, so that this present enormous loss of fertility is entirely unnecessary. The preservation or replacement of the forests is one of the most important means of preventing this loss. We have made a beginning in forest preservation, but . . . so rapid has been the rate of exhaustion of timber in the United States in the past, and so rapidly is the remainder being exhausted, that the country is unquestionably on the verge of a timber famine which will be felt in every household in the land . . .
"The present annual consumption of lumber is certainly three times as great as the annual growth; and if the consumption and growth continue unchanged, practically all our lumber will be exhausted in another generation, while long before the limit to complete exhaustion is reached the growing scarcity will make itself felt in many blighting ways upon our national welfare. About twenty percent of our forested territory is now reserved in national forests, but these do not include the most valuable timberlands, and in any event the proportion is too small to expect that the reserves can accomplish more than a mitigation of the trouble which is ahead for the nation . . .
"We should acquire in the Appalachian and White Mountain regions all the forest-lands that it is possible to acquire for the use of the nation. These lands, because they form a national asset, are as emphatically national as the rivers which they feed, and which flow through so many States before they reach the ocean . . ."
Of the nearly 2.3 billion acres of land in the United States, approximately 650 million acres, or 28 percent, are owned by the Federal Government. Four agencies administer 96 percent of this Federal land for conservation, preservation, and/or development of natural resources. These four agencies are the Forest Service in the Department of Agriculture, and the Bureau of Land Management, the Fish and Wildlife Service, and the National Park Service in the Department of the Interior. The majority of these lands are in the West, a result of early treaties and land settlement patterns. Early in the history of the United States, the Federal Government owned as much as 80 percent of the total land area, but has disposed of more than 1.1 billion acres to States and to the private sector. Each of the four primary Federal land management agencies has its own unique mission and special responsibilities for the lands and resources under its jurisdiction. The National Park Service, although the smallest with 78 million acres, is probably the best known to the public for preserving, protecting and interpreting the natural, cultural, and historic lands and resources of the Nation. The U.S. Fish and Wildlife Service manages 87.5 million acres for the conservation and protection of fish and wildlife, allowing economic developments that are compatible with the purposes for which conservation measures were established. Both the Bureau of Land Management (BLM) and the U.S. Forest Service support a variety of uses on the lands which they administer, including recreation, timber harvesting, livestock grazing, fish and wildlife habitat, and wilderness. Most of the 266 million acres of BLM lands are rangelands, and more than half of the 191 million acres of Forest Service lands are forested. This report provides a background of current Federal land and resource ownership, a sense of the historical development of the Nation's land and settlement laws, and a basic understanding of each of the natural resource agency's missions and management. For discussions of natural resources management issues, such as timber harvesting, grazing, mining, fisheries and wildlife management, threatened and endangered species, private property rights, wetlands, and coastal issues, see CRS Report 95-92 ENR, An Introduction to Major Natural Resource Issues in the 104th Congress. Each section of this report is followed by a list of references, which includes various CRS publications on issues related to Federal lands and management systems.
. . . to improve and protect the forest within the reservation, or for the purpose of securing favorable conditions of water flows, and to furnish a continuous supply of timber for the use and necessities of the citizens of the United States. It is the policy of the Congress that the national forests are established and shall be administered for outdoor recreation, range, timber, watershed, and wildlife and fish purposes. The purposes of this Act are declared to be supplemental to, but not in derogation of, the purposes for which the national forests were established as set forth in the Act of June 4, 1897. . . The establishment and maintenance of areas as wilderness are consistent with the purposes and provisions of this Act. The Multiple-Use Sustained-Yield Act directs resource management of the national forests for the combination of uses that best meets the needs of the American people. Management of the resources was to be coordinated for "multiple use"--considering the relative values of the various resources, though not necessarily maximizing dollar returns, nor requiring that any one particular area be managed for all or even most uses. The Act also calls for "sustained yield" -- a high level of resource outputs maintained in perpetuity but without impairing the productivity of the land. Note: The Congressional Research Service (CRS), part of the Library of Congress, prepares its reports for the U.S. Congress. CRS products undergo review for accuracy and objectivity and contain nontechnical information that can be very useful to people interested in environmental policy. CRS does not itself provide these documents to the general public. Although CRS documents are prepared specifically for Congress and not widely distributed, their distribution is not protected by law or copyright. NCSE is committed to expanding, maintaining and updating its database of reports, making them available and searchable for the public.